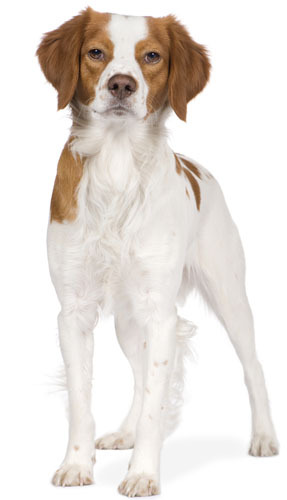 Learn about the temperament and personality of the Brittany. Discover what he's like to live with, his traits and characteristics and how he generally behaves. And look at lots of Brittany photos. The Brittany is an award-winning, widely-admired hunting dog, and has recently become popular as a family pet, due to their happy, friendly, affectionate disposition and their intelligence and versatility. They are people-oriented and attention-loving. They will need to spend a lot of time with you. They do not do well if left alone for long periods of time. They love to be loved, but they also love to work. They need a job to do, as they crave mental stimulation. Boredom, loneliness, or pent up energy will lead them to destructive behavior. So they also need lots of exercise. They love to run and will need to do so daily. A busy Brittany is a happy Brittany, and they do well with children, and most Brittanys do well with other dogs. (Some Brittanys show aggression towards other dogs and cats.) It is said that Brittanys are not a breed for generalizations -- they range from high-strung to mellow, and from docile to stubborn. But usually they are gentle, active, alert, and playful dogs who make great companions in a home with an active lifestyle. The Brittany sheds a fair amount of hair. You'll find hair stuck to your couch, carpets, clothes and everything else in your home.